It’s remarkable how much a town name can influence us. I guess all the past experiences of a place distill our impression, so it's no surprise that the Jurgens Jindabyne struck a chord with me. Nestled into the lee of the Snowy Mountains, the town promises excitement and a holiday atmosphere and, of course, the evocative image of hardy mountain folk. And let’s not forget, when blanketed in snow, it’s a pretty cool place. To me, the Jurgens version is pretty cool, too. It’s a hardy, dirt-road capable tourer in a practical pop-top configuration with a compact layout that packs in the essentials without stretching the budget or towing capacity of smaller vehicles. Jurgens originated in South Africa where conditions on the roads and distances travelled are similar to here. For the last 10 years, its Melbourne factory has produced a broad range of vans with distinctive body shapes and colours. 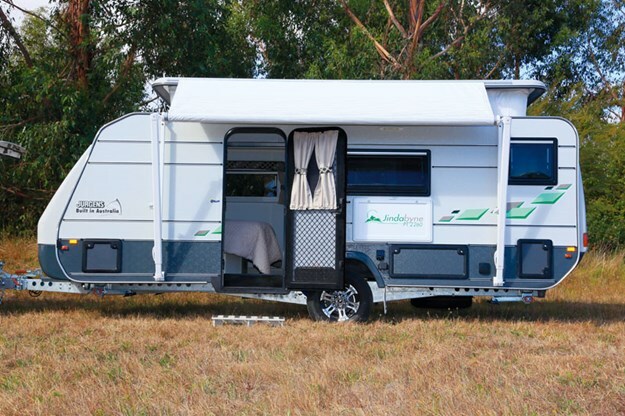 With an external body length of 5.52m (18ft 1in) the Jindabyne is the larger of two Jurgens pop-tops on offer, but there are a number of layouts to suit a variety of needs. 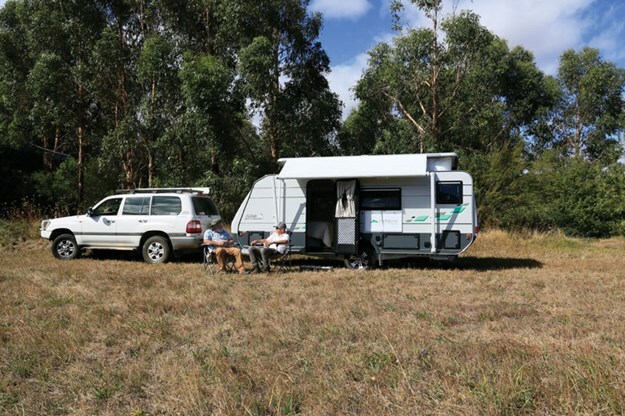 Our test van was the 2660 style hat offers a full ensuite and shares the same basic footprint with five other Jindabyne iterations, including a bunk van, which is a pretty good achievement for such a compact design. By employing a modular approach to construction and interior design, Jurgens has been able to keep the purchase price down, and by applying a well-engineered approach to weight saving, costs of towing are reduced. It’s a winning formula for those who can appreciate the conservative appeal. So while it might not stand out in a world increasingly populated by extreme offroaders, its pared-back simplicity makes a lot of sense. Because it’s easier to tow, a small van is a much less intimidating option for first-timers, many of whom find the prospect of negotiating a 20-footer through heavy traffic, a party stopper. The low line of the pop-top looks a safer prospect, with the added benefit that the retracting roof cuts down on air resistance and will fit more easily into many garages and carports. Construction of the body differs from the timber frame construction of most local builders. Duratherm walls consist of a stucco patterned aluminium outer surface over a 20mm composite centre of an integrated strengthening matrix in high-density foam and a plywood inner liner. The robust structure gives strength and rigidity to the body and seals the van from the weather. Moulded fibreglass end caps complete the exterior architecture and help provide the distinctive rounded shape of most Jurgens across the range. Under the van is a galvanised Jurgens-designed bolted C-section chassis with extra strengthening at high-stress points. The suspension is a single axle independent AL-KO rubber torsion-bar system with a single shock absorber each side. The setup requires minimum maintenance and with the wheels finding their own level it works well over moderately rough ground. Ground clearance isn't great, but the low centre of gravity means it travels true on smooth surfaces. A single piece waterproof floor and a moulded fiberglass roof ensure a weatherproof interior. An 80L water tank sits forward of the axle, and the spare is slung below the van at the rear. It keeps the rear end tidy and can be deployed by a wind-down jack if it’s ever needed. Outside storage options include a front boot and a couple of small hatches along the side. 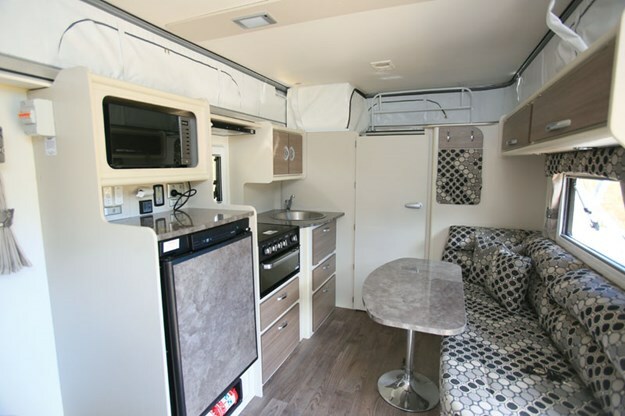 The boot houses a pair of 4.5kg gas bottles and tools, leaving space for a couple of folding chairs and floor mats and a removable travel blanket covers the front window. Corner handles assist moving the van around when stored on a flat, hard surface and the body proved light enough for them to be actually useful. Setting up this latest Jindabyne has been made easier with the fitting of a new roof-raiser. I hope I'm not misquoted here, but in the previous version, some fellows were having trouble getting it up after a long drive. The old system was a tad cumbersome and hard to lift, but the new style is a significant improvement. 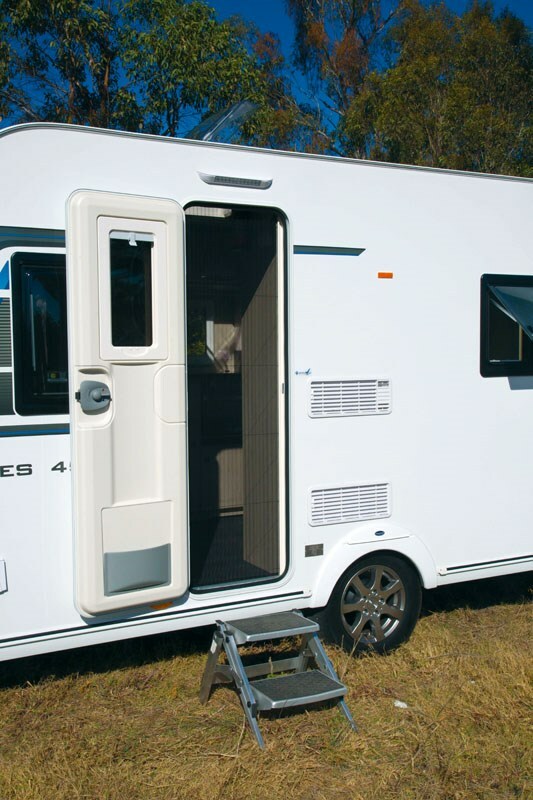 Having the locking mechanism on the inside means you only have to disengage the awning from the outside then release the easily reached catches without having to wander around the outside of van finding the latches. With the top down there's 1.57m (5ft 2in) of head height, so you need to bend until the roof is raised to a generous 2m (6ft 8in). Entry is towards the front van through a triple lock door with flyscreen, and there is a removable lightweight step and a handy grip. Layout has the sensible arrangement for a small van of the doorway at the front to take advantage of the gap between the bed and living area. This leaves the ensuite at the rear and the central dining area on the near side with the kitchen opposite. Colours feature brown/grey and white tones on the hard surfaces and a choice of fabrics on lounges, bulkheads and pelmets. It might sound a bit drab, but surprisingly the busy black, grey and white of the soft furnishings lent an upbeat theme. Double glazed windows in the kitchen, dinette and bedroom add to the zippered sections of the pop-top curtain to shine plenty of light. The compact kitchen runs along the offside with a Thetford 93L three-way fridge under a small food preparation bench, which also makes a handy resting place for hot items from a microwave above. Further back is a stainless steel sink and Thetford cooktop Mk3 that includes the grill and four burners. A small opening window and a Finch Rangehood should keep things well ventilated when cooking. On a wall panel above the fridge, I found the gauges for the water tanks level, battery condition and switches for gas and electric hot water, as well as the 12V and 240V powerpoints. The L-shaped lounge at the dinette proved comfortable and because the table swivels, settling in was straightforward. Things are different to most vans up front. 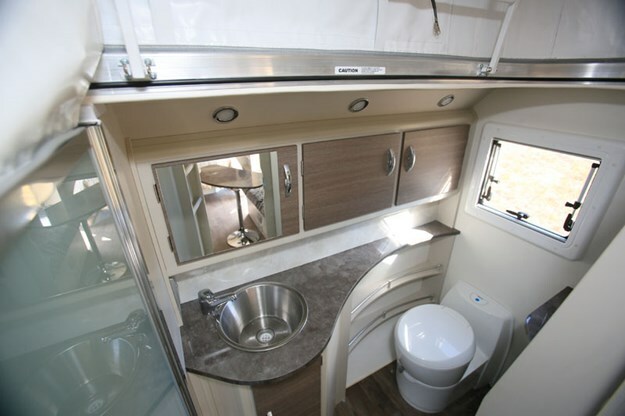 Alongside the caravan queen island bed (6ft 3in x 4ft 7in), instead of a window on the near side there's a vanity with mirror and drawers. It's a good use of space, and there is still plenty of opportunity to take in the views through the front and offside windows. Segregated areas under the bed separate the water heater and water pumps from an ample storage space. A solid door leads to the ensuite where a moulded shower has a seat and shelves for soap and such. A vinyl extension between the roof and wall seal the shower, but the top section of the rest of the bathroom is open. I noted good use of the back wall for storage in cupboards and a vanity with sink and mirror. Ventilation is taken care of with a roof fan and an opening window. In travel mode, the Jindabyne van has a height of only 2.33m, so it rode only a foot or so above my LandCruiser, and the low stance seemed to portray a long and lean sporty image on the road. As you would expect, the little pop-top was no challenge for my Toyota because even those with mid-sized family cars can happily head off on holidays with the Jindabyne in tow. I can report that the rubber suspension worked well, and progress was smooth, even over the rough ground we found when searching out a suitable place for photography. 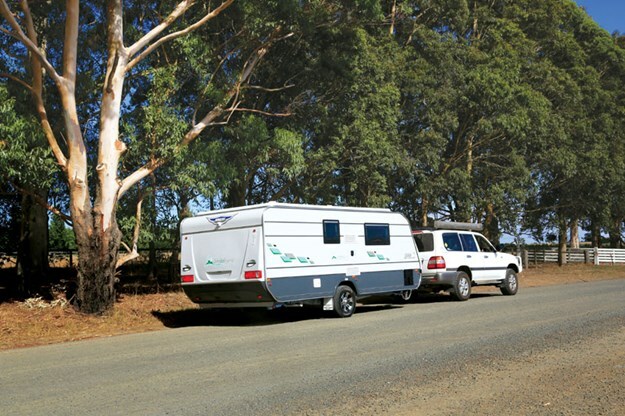 While the Jindabyne will mainly see service in caravan parks, a 12V battery recharged from the tow vehicle will allow lights for remote stays, while gas supplies the stove and water heater. 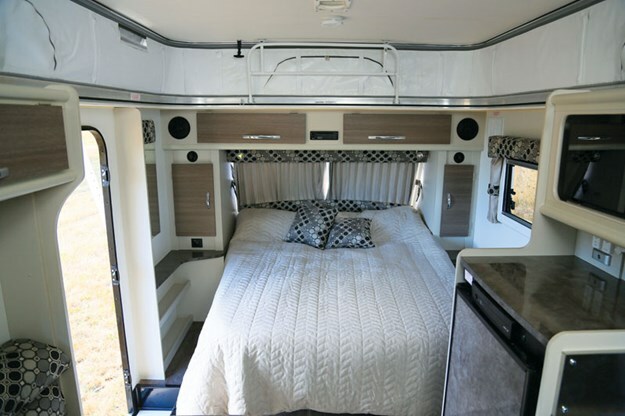 The asking price of $44,990 is a competitive one for the little Jurgens and, with a three-year warranty on the structural components, owners should be confident of a trouble-free life on the road.